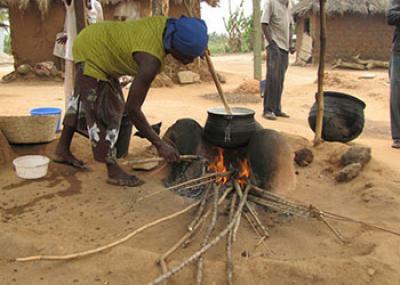 A three-year, international study on the impact of open-fire cooking on regional air quality and disease will break new ground by bringing together atmospheric scientists, engineers, statisticians and social scientists who will analyze the effects of smoke from traditional cooking methods on households, villages, and entire regions. Researchers will combine newly developed sensors with computer and statistical models to look at what happens to human health when traditional cooking methods are used. They will also evaluate whether newer, more efficient cookstoves could reduce disease and positively affect regional air quality. The project brings together a diverse team of pollution, climate, and health experts from the National Center for Atmospheric Research (NCAR), the University of Colorado Boulder, University of Ghana School of Public Health and Ghana Health Services. Funding comes from the National Science Foundation, NCAR's sponsor. The researchers will focus primarily on northern Ghana, where they will examine possible links between air pollutants and such diseases as meningitis. Their findings are expected to provide information to policymakers and health officials in other developing countries where open-fire cooking or inefficient stoves are common. "Often when you visit remote villages in Ghana, they're shrouded in haze for many miles from all the fires used for cooking," said CHANS-Net member Christine Wiedinmyer, NCAR atmospheric chemist overseeing the project. "Given that an estimated three billion people worldwide are cooking over fire and smoke, we need to better understand how these pollutants are affecting public health as well as regional air quality and even the climate." Wiedinmyer and her colleagues will use a novel combination of local and regional air quality measurements -- including specialized smartphone applications that are more mobile than traditional air quality sensors -- and cutting-edge computer models of weather, air quality, and climate. The researchers and student assistants will also survey villagers to get their views on possible connections between open-fire cooking and disease as well as their interest in adopting different cooking methods. Cooking fires in developing countries are a leading source of carbon monoxide, particulates, and smog. These can cause a variety of symptoms, ranging from relatively mild ailments, such as headaches and nausea, to potentially life-threatening conditions, including cardiovascular and respiratory diseases. The fires also emit carbon dioxide and other heat-trapping gases that, when mixed into the global atmosphere, can affect weather patterns and warm the climate. As regional temperatures warm, that in turn can act to increase the level of air pollution, thereby potentially leading to greater health risks. The project builds on other NCAR projects studying links between the atmosphere and human health. These include the development of specialized forecasts of weather conditions associated with the beginning and end of outbreaks of meningitis in Africa. "We're excited about the opportunity to continue working with our collaborators in Ghana and to help alleviate a major health problem across the Sahel of Africa," said Mary Hayden, NCAR medical anthropologist. "Bringing together an international transdisciplinary team of social scientists with climatologists, atmospheric chemists, and engineers to tackle the problem is the first step in addressing these complex human-environmental problems."